Gracias a la vida – Step by step (Part 2) – Learning Spanish language with “the sound of music”. Gracias a la vida, Thanks to Life, is a powerful and enduring song, one of the most covered songs in Latin American history. It was composed by the legendary Chilean songwriter Violeta Parra (4.10.1917 – 5.02.1967), a pioneer of a Latin American movement known as La Nueva Canción, The New Song. In addition, her contribution to Latin American art and particularly to folklore has been invaluable. 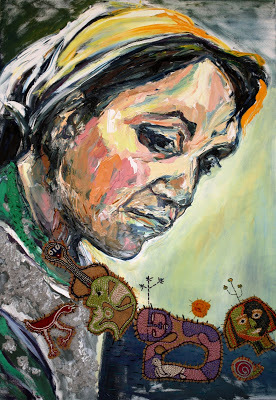 Dulce vecina de la verde selva – Violeta Parra – Mix media. Courtesy of the artist Claudia Martínez © Claudia Martínez. 2011. For a link to the blog of this artist, please click here. The song Gracias a la vida became a theme tune for a distinct period of my life. A time in which, I reunited with my family after a long absence, a moment of great joy. Have you ever experienced a song that captures exactly the mood and a moment of a time in your life? It’s perhaps the unique combination of music and lyrics, the distinctive voice of the singer, all meeting and combining with your personal circumstances to create the perfect soundtrack to one’s life. Somehow it becomes a private relationship between the words, the melody and you. Has this happened to you? Gracias a la vida, a song or an anthem? Many performers have interpreted this anthem via diverse musical genres: from Flamenco to Salsa and various remixes; and it has also been translated into many languages. “Violeta” – Mixed media – 1.00 x 1.00 mt. Courtesy of the artist Claudia Martínez © Claudia Martínez. 2011. For a link to the blog of this artist, please click here. I would reiterate that frequent exposure to Spanish is essential in order to become familiar with its sounds and expressions. Students should be eager to integrate Spanish into their everyday life when starting to learn the Spanish language to achieve effective learning. Listening to Spanish lyrics from native Spanish speakers was suggested as one of the many options Spanish language students have today (See: Step by step. Part 1, 2 May 2014). The following link takes you to a version, with subtitles, sung by Mercedes Sosa, an Argentinean singer, perhaps one of the most heard interpretations of this song: click here. American singer Joan Baez’ version begins with a brief introduction. She starts singing at 2.14: click here. On 27 February 2010, there was a terrible earthquake in Chile. It is considered one of the strongest registered in history. The energy released was equivalent to 100,000 Hiroshima atomic bombs. 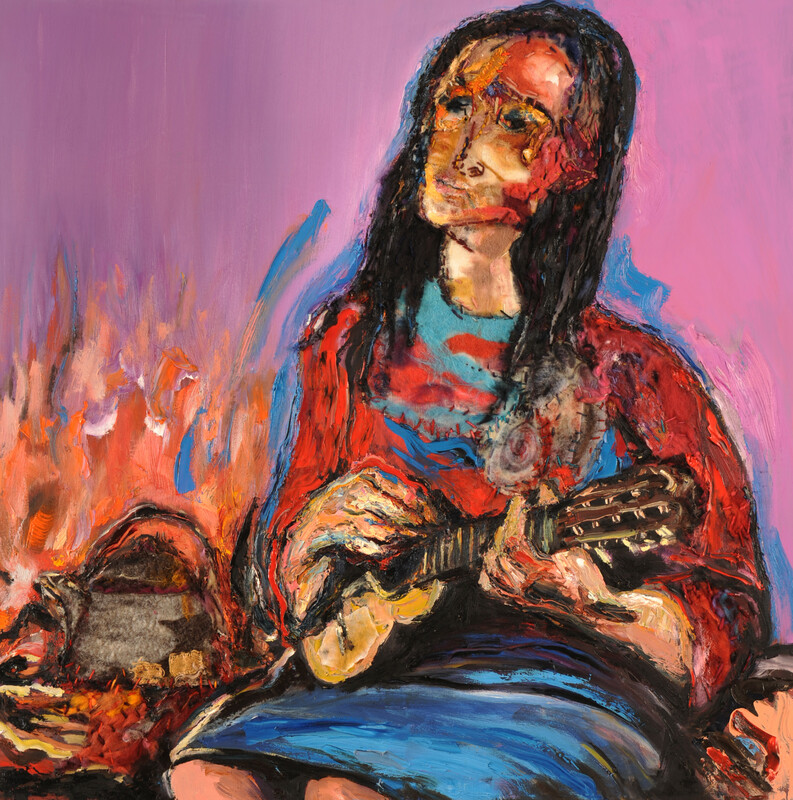 Despite Violeta Parra no longer being with us, her voice was there to sing and help the victims. A group of singers united their voices: Beto Cuevas (Chilian), Laura Pausini (Italian), Ferh Olvera (Mexican), Shakira (Colombian), Juanes (Colombian), Miguel Bosse (Panama/Colombia) producing a new version of Gracias a la vida. The single was named: Voces unidas por Chile. To hear this version please: click here. 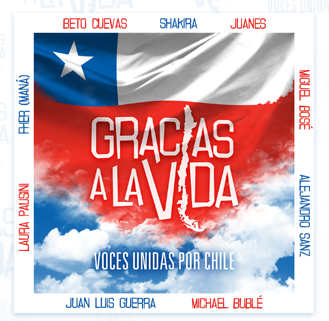 Cover of the single Gracias a la vida, created by United Voices for Chile. An initiative to support the earthquake’s victims originated by Beto Cuevas and produced by Humberto Gatica. Gracias a la vida, and to Violeta Parra, who gave so much and received too little recognition for her work whilst she was alive. So, before we leave, I would like to suggest that you listen to the original track sung by Violeta Parra: click here. The song Gracias a la vida provides a great opportunity to discover which of the many versions is your particular favourite. Surf on YouTube and try to find the four best versions for you. Have you found any other interesting versions that you would you like to share with us? Please add your comments below. This is a follow up article Step by step – Learning Spanish language with “the sound of music” (Part 1), published 2 May 2014. Ana Belén, en el escenario junto a la cantautora catalana María del Mar Bonet y varias familiares (hija, nieta y bisnieta) de la polifacética artista chilena Violeta Parra (San Carlos de Itihue, 4 de octubre de 1917 – Santiago, 5 de febrero de 1967). Me enteré que estás preparando una nueva exposición de tus pinturas. Es en el Luna Park? Por favor, ¿me podrías pasar los datos? Es posible que esté en Buenos Aires para esa fecha y me gustaría ver tu muestra. Le escribiré a Claudia directamente para que lo anunciemos aquí en el blog también. Si, estoy preparando una muestra conjunta con algunos colegas. Muchas gracias por tu interés, me encantaría que estuvieras por allí. Te paso información y quedo a tu disposición. ¡Un saludo! Horarios: LU-VI de 12 a 20hs / SAB de 11 a 20 hs. Dirección: Bouchard 475, Capital federal. ¡Gracias Adrian por tu interés y difusión! Una canción realmente universal, les paso una versión de un duo de Corea del Sur: Davichi (Lee Haeri(이해리) and Kang Minkyung(강민경) cantada en español y subtitulada en español e Inglés, impresionante! Tania Libertad, cantante peruana. Aquí su interpretación de Gracias a la Vida. Hi, here is a version from Brazil, the great singer Elis Regina, interpreting this song, which was recorded in 1976 in the LP Falso Brilhante. Esta es la versión original por si no la han escuchado, es la voz de Violeta. Thank you Cindy, Hector, Claudia, Kevin, Marita, Lucía, and Tony for helping me with this article, or stopping by, and contributing with your favourite version of the song “Thanks to life”. …and again “Gracias a la vida y gracias a Violeta Parra” for bringing us all together! This was fascinating! I want to come back and really study this post (and part 1). Maybe a treat for myself after National Novel Writing month is done. Thanks so much for this. Hugs. Thank you very much Teagan, You are very welcome. I hope you come back after the National Novel Writing month, enjoy the music and I am looking forward to more feedback from you. Hi Adrian, I hadn’t heard this song before, but now I’m hooked. 🙂 A great mix of versions here with the Mercedes Sosa version being my favorite and the Davichi a close second. Thanks for sharing this song and it’s beautiful lyrics. Maybe it will help revive my dormant Spanish. I m glad you enjoy the song. It is an inspirational song for me. Teaching a language in this context, with meaningful songs like this one, can be very motivational. I hope you continue finding this blog helpful with your Spanish.